Pi is the Greek letter“π”. Its isthe symbol used in mathematics which represents a constant and it is also the first letter of the Greek word, περ?μετρος, meaning perimeter. Pi Day is an annual celebration day celebrated in favor of the mathematical constant π (pi), this day is observed on March 14 (3/14 in the month/day date format) while 3, 1, and 4 are the initial three significant digits of π — the ratio of the circumference of a circle to its diameter — which is more or less 3.14159. It was founded by the great Physicist Larry Shaw in 1988. In the year 2009, the United States House of Representatives supported the title of Pi Day. While the Pi Approximation Day is observed on July 22 in the date and day/month format was - 22/7, as the fraction ?22⁄7 is a frequent approximation of π, which is precise to two decimal places and dates from Archimedes. Pi has been calculated to over one trillion digits beyond its decimal point. As a transcendental and irrational number, it will go on infinitely with no replication or different patterns. While only a handful of digits are required for typical calculations, Pi’s infinite character makes it a fun challenge to learn by rote and to computationally calculate even more digits. In recent years, mathematicians have called for replacing pi by tau (τ) as a method to explain the association between a circle’s perimeter and its radius. In order to increase the word about the recompense of tau over pi, mathematicians around the world recognized this day and celebrate Tau Day on June 28. The Massachusetts Institute of Technology has frequently sent its request letters to potential students for delivery on Pi Day. Starting from 2012, MIT has announced that it will post those decisions (in private) online on Pi Day by 6.28 pm; which they have called "Tau Time", this was to honor the rival numbers pi and tau evenly. But whereas in 2015, the standard decisions were put online at 9:26 AM, following the year's "pi moment". The town of Princeton, New Jersey, hosts many events to celebrate both Pi Day and Albert Einstein's birthday, which also falls on March 14. Einstein lived in Princeton for more than 20 years while working at the Institute for Advanced Studies. In addition to pie eating and performance contests, there will be annual Einstein look-alike contests held in the city. While on March 14th, 2016 the Monterey County Skeptics held a pi day challenge; the goal is to just get the people off from their computers and meet each other in real life. They also challenged skeptic groups across the world to do the same. Several groups from across the world follow this event through their Facebook page. The Monterey County Skeptics is in hopes to make this an annual event and is once again putting out the challenge to all the other pessimist groups on Facebook to program a social network and event groups on March 14th, 2017 to celebrate Pi Day. Pi is a homophone of pie - both the words are marked similarly but are spelled in a different way and mean different things. Celebrate Pi Day by having your favorite pie. Find out and participate in the pie baking contest, and bake different pi shaped pies. 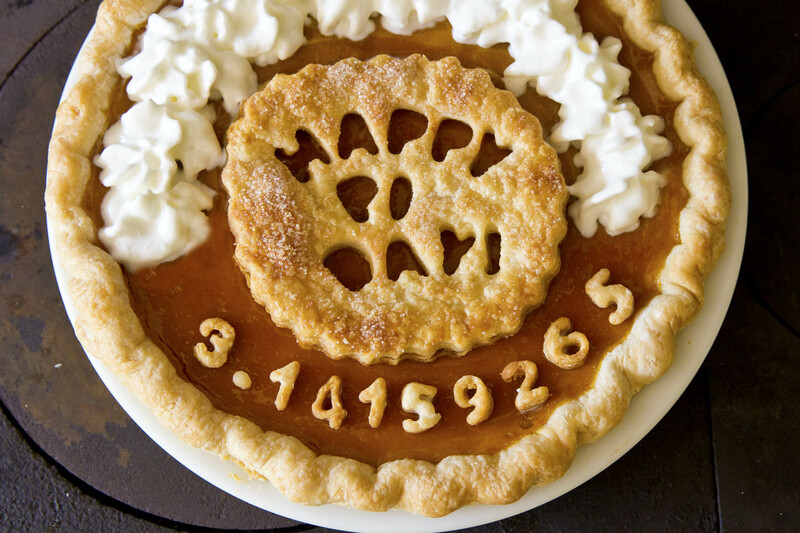 Arrange a pi performance contest, tell the people who can recite the most digits of the constant gets to take a pie home. Wear a t-shirt which has the numbers of pi on it, you can also wear accessories, earrings; etc. Gather with your peers and eat foods which start with a pi, like pizza, pineapples or foods that are circular shaped like cookies, pancakes, and brownies. Watch the Darren Aronofsky 1998 movie, Pi. The Gregorian Calendar is full of dates that were written in a extraordinary manner and these dates represent a mathematical or scientific concept. While some of the days and dates include: Yellow Pig Day, Fibonacci Day, Mole Day, Square Root Day, Sequential time, Palindrome Day and e-Day.